One thing the Raiders have over the Niners Franchise is that the Raiders can claim the title of being "involved in more monumental games thus developing better rivalries" Holy Roller, Immaculate Reception, Sea of Hands, Ghost in the Post ect. Raiders can go through all the AFC WEST and every player, coach, fan and hotdog seller will tell you that the Raiders are there best rivalry. Then there's teams outside of the AFC West that if you were to ask who there teams best non division rival is "they would most likely say: Raiders"
The reason why the Raiders have so many rivals, is they are the team you love to hate, They made so many of the Baby Boomer and Generation X generation turn off there TV'S in disgust. If you were playing the Raiders and had the lead, 9 out of 10 times the Raiders would come back and steal the game. Another particular reason I hate the Raiders is because of how this team was managed. Al Davis only went to Los Angeles for the money. He didn't care about leaving the fans behind, he wanted the money. The Raiders were hated so much, that when John Elway was still very young, Al Davis tried to trade for him. But when the deal was sent to the league, the commish stepped in and stopped the trade from ever happening. Most Raider fans are conceited and are so biased towards other teams even in serious talk. You're not one of them pawno, but at times you make me believe you are. The record means nothing to me. I don't care how many more wins you have, this franchise was always built to try and dominate an era. And we've succeeded the majority of the time. 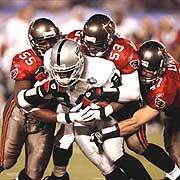 xbaywarrior wrote: Another particular reason I hate the Raiders is because of how this team was managed. Al Davis only went to Los Angeles for the money. He didn't care about leaving the fans behind, he wanted the money. The Raiders were hated so much, that when John Elway was still very young, Al Davis tried to trade for him. But when the deal was sent to the league, the commish stepped in and stopped the trade from ever happening. But as much as i would love 5 Superbowls in my cabinets, i think i'd prefer to take the 3 Rings the Raiders have won. Being the only team apart from the Steelers to reach 3 superbowls in 3 different decades poises us to be the more likely team to reach the superbowl before the Niners. I'm not taking anything away from this current Niners crop (You guys are showing signs of a potent offense and a up and coming Defense) but you need to have Sensational teams to reach the Superbowl and quite frankly Al Davis has a better eye for picking talent then Mr York (In my Opinion) The Raiders will be riding on the coattails of Jamarcus Russell within the next 5-10 years and be adding more Lombardis. Niners will be in that stereotyped pidgeon hole of "Can't win a Superbowl without Montana or Elway" That Denver fans hear on a weekly basis from us Raider Nation. pawnograffiti wrote: If you were playing the Raiders and had the lead, 9 out of 10 times the Raiders would come back and steal the game. Yeah, a pity it didn't happen against the Bucs in the SB. Okay, can we go away from the whole, "I dont like you, and I dont like your team, so I'm going to cuss you out?" New topic here: Alex Smith vs Jamarcus Russell. sfsfsfgiants wrote: New topic here: Alex Smith vs Jamarcus Russell. This would be like the Morrison vs P-Willie discussion, just worse. Russell still hasn't played a snap in the NFL. They can't be compared at this point. sfsfsfgiants wrote: Alright, uhh....Gore vs Jordan? I'd like to see how pawno tries to defend picking Lamont Jordan (or Rhodes or Michael Bush, for that matter) above Gore. Gore is one of the best running backs in the NFC, and Jordan isnt even in the top two in the division. Gore is actually quite a talented runningback.. but still i couldn't compare him to Lamont Jordan cause they are 2 different moulds. Gore has electrifying speed and can get to the edges very quick... But he has nothing on Lamont Jordan on being a bruising runner up the middle. I actually do like Jordan, and he really is a tough player, but I have to take Frank Gore for this year, next year, and ten years from now. Michael Bush has potential, but he is going to prove that he is healthy for me to say that he is going to be good. NEXT TOPIC: The argument that both sides can have and believe in the most: Defensive Backs. I say that the 49ers have a much better defensive back core this year. The Raiders have some pretty good young players on them, but I really am not that high on Michael Huff. Asumougha is a good player though. I will take Nate Clements, Walt Harris, and Michael Lewis any day, though. sfsfsfgiants wrote: I actually do like Jordan, and he really is a tough player, but I have to take Frank Gore for this year, next year, and ten years from now. Michael Bush has potential, but he is going to prove that he is healthy for me to say that he is going to be good. Not even... no way your DBacks core comes even in the league of the Raiders. Don't forget the Raiders got Linebackers that play like DB. Thomas Howard can move as fast as any DB and Kirk Morrisson has hands like a DbB. We could do it that way and say that we have the two fastest linebackers in the league in P-Will and Manny Lawson, but I'm talking about strait up d-backs. I can admit that you have it a whole hell of a lot better for the future, but for this season, the 49ers have a lot more experience, and they are name players. Not washed up, either. Only rate your four starters, for THIS YEAR. Not how good they could be, but how good they are this year. Roman - don't like him either, but he comes up big when we need him. Go ahead pawno, post up what you think. Next topic: Davis vs Miller. Who looks to have a better future? Harris - Surprising season last year. I saw him get burned way too many times with the Redskins (was known as "Toast" Harris by that time). I'm not sure if it's him or Nolan's system what makes him look good. Still not sold. 7/10. Lewis - Not bad. Not great, either. Reminds me a lot to Jermain Phillips. 7/10. Huff = More future than present. I think he'll be a good one, but probably won't live up to his draft hype. 6/10. Is this a joke?. I mean, you're really asking who's gonna be a better TE?. I refuse to answer this question.